If you’ve ever wondered what the correct method for patterning your shotgun for waterfowl is, then look no further. In this guide we’ll discuss the best ways to pattern a shotgun for waterfowl and tips that will help you develop the best pattern possible. It’s hard to believe, but the vast majority of waterfowl hunters have never patterned their shotgun. I get it, time is a valuable commodity and if something is working OK, then why bother with it? Well, the simple answer is that patterning your shotgun can help make you a better hunter, increase the chance that each bird you take is harvested cleanly, and keep ammo costs lower by reducing wasted shots. In this guide, we’ll discuss step by step the best way to pattern your shotgun so that you can maximize you success during waterfowl season. Patterning your shotgun is actually pretty darn easy if you devote the time needed to do it right. The total time it takes varies, but if your intention is to pattern one type of shell, then it can be completed in less than 30 minutes. Below is the method you should follow in order to pattern you shotgun for waterfowl. A good pattern for waterfowl is the result of a shotgun, choke, and ammo all working together. If even one of these is off, the pattern could be useless. This is why it’s so important to pattern your shotgun with as many different types of shotgun shells and choke combinations as possible. The gun you shoot is the least important factor that will contribute to a good pattern. Your choke and load combination is really what you should focus on. I like to start off patterning with shotgun shells I’m familiar with, usually a 12ga 3 inch load of #3’s and a modified choke. This gives me a baseline to start with and I can either tighten the choke by switching to a light modified or loosen it by switching to an improved modified. If switching the choke doesn’t improve pattern results, I’ll either try a different brand of choke or switch to a different brand of ammo. Finding shotgun shells that pattern well can be a juggling act of ammo and choke combinations. If you’re looking for a premium choke tube to try out, check out my list of top choke tubes for waterfowl here. Pattern your shotgun with the ammo you will be hunting with the most. Try your factory choke tubes first before switching to a premium choke tube. Modified chokes work best with steel shot across a wide range of conditions. Make sure your shotgun is properly fitted for you. Choose ammo with the right pattern density for either ducks or geese. Steel shot sizes for ducks range from #6’s to #2’s, and shot sizes for geese range from #1’s to T-shot. You’ve found which gun, choke, and ammo you’re going to use, but now you need to find where to pattern it safely. This could be family or friends land or your hunting lease may allow patterning in the off season. Wherever you decide to pattern your shotgun, make sure that you have at least 40 yards to do so. 30 to 40 yards is the average range most decoying waterfowl are harvested at. It should be the starting point for evaluating your patterns. Ranges can be extended past 50 yards for late season snow goose hunting, but for standard duck decoying action I like to stick with 40 yards as a maximum patterning distance. Avoid using backstops like trees or other dense objects that could cause pellets to ricochet or even fly back at you. And always be aware of what lies beyond your backstop. Patterning boards come in many different sizes and shapes. You can make one yourself with materials you probably have on hand. All it takes to build a patterning board is to construct a wooden frame 60 inches in diameter. With the frame built, you can use builder’s paper to cover the front. This is the builder’s paper I use and it’s cheap. After each shot, just replace the paper and you’re ready to pattern another load. I use a staple gun to quickly put a new layer of paper over the wooden frame. This pattern board method has worked really well for me over the years. Another patterning board option to consider is using a hay bale. Hay bales make great platforms to tack up patterning paper without having to construct a frame. Aftermarket targets, like this one you can get at Amazon, has the imprint of a duck already on it and a 30 inch circle for easy ballistic calculations. Use what you have. Build a wooden frame or use a hay bale. Builder’s paper is a cheap and quick way to cover a large patterning area. 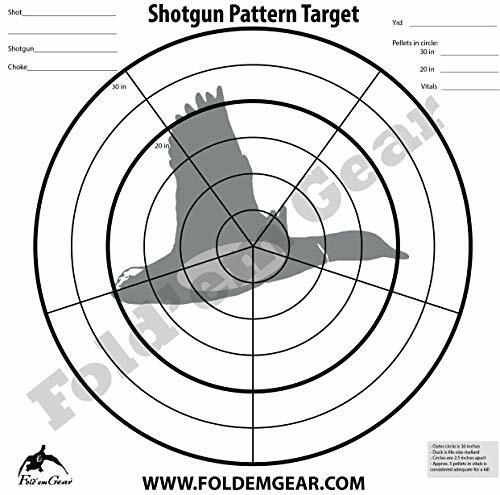 Premade targets like the Fold’em Gear Shotgun Target make pattern evaluations easier. Click here to see it a Amazon. Use staples to quickly put new pattern paper over old. Place the patterning board at the range you’ll be shooting at in the field. 40 yards is a good starting point. Now that you’ve picked your gun/ammo/choke combination, secured a place to pattern it, and built a patterning board, you’re ready to test the first rounds. While on level ground, fire the first round at the center of the patterning board. Try to aim as close to the center of the patterning board as possible. After years of patterning, getting a center placed shot on the board can sometimes be difficult. Jumping before the shot and wind drift can cause the pellets to be off to one side or even miss the patterning board altogether. Due to these issues, I recommend that your patterning board be at least 60 inches in diameter and to use a gun mount that locks in place if you have one. This will ensure each shot is dead center and you will be able to evaluate each pattern effectively. If you can’t get consistent center hits, get a gun mount stand that locks in place. Here’s one I recommend. Avoid patterning your shotgun on windy days that could negatively influence the pattern. If you shoot freehand, use a wider patterning board to help counter off center shots. The larger the patterning board, the better you’ll be able to see the entire pattern. I prefer to evaluate my patterns later and be able to review them at any time in the future, but you can also do it in the field. Just a quick visualization will tell you most of what you need to know about even pellet distribution, pellet density, and generally if the load is acceptable or not. The reason I suggest evaluating results later is that it’s easier to overlay a 30 inch circle at the center of the pattern digitally than it is to draw in the field. A 30 inch circle is the standard diameter which waterfowl patterns are evaluated. I avoid drawing a 30 inch circle before I pattern my ammo because rarely does my shot stay directly on center. Instead, pick the densest area of the pattern and then draw in the 30 inch circle. This will give a more complete picture of what the shotgun pattern is actually doing. Write the load and yardage measurements on the patterning paper for each load. Circle each pellet hole with a sharpie so they stand out better. Take a photo of each pattern to review at a later time. Draw your 30 inch circle after you shoot, not before. You will never be directly on center. As with most repeatable processes, it’s unwise to judge ammo based on the pattern from one shot. The standard for patterning a shotgun for waterfowl is a three shot average. Scoring a pattern is simply counting the amount of pellets that land in the 30 inch diameter circle and dividing it by the amount of pellets in the load. A 1.25 oz load results in 124 (#4) steel pellets inside a 30 inch circle at 40 yards. There are 156 (#4) pellets in a 1.25 oz load. 124/156 = 80% pellets in a 30 inch circle. This is the type of calculation that should be conducted for each round patterned. The three percentages can then be averaged together for a three shot average total. If you need to know how many pellets are in your shells, check out the pellet count table here. The three shot average is more important to use with loads that pattern slightly inconsistent. Very rarely will ammo pattern great if the first pattern result is horrible. Why go through all the trouble to pattern a shotgun if you’re not even going to analyze the results? While the quick visual test might work for some, it’s important to know what to look for. The two most important factors to consider while reviewing your pattern results are pellet distribution and pattern density. Pellet distribution is the spacing of pellets as they expand outward. An example of the perfect pattern would be every pellet in a load making it inside a 30 inch circle while perfectly spaced. While the perfect load is impossible to replicate for waterfowl hunting, it’s important that pellets are evenly distributed to avoid creating gaps in the pattern that fast moving ducks and geese can slip through. Patterns with large blotches or areas where no pellets exist are a red flag to either switch chokes or avoid using the load altogether. What pattern density is the best for ducks and geese? Pattern density is the amount of pellets that end up on target and how tightly. Ways to increase pattern density are to use smaller shot (which increases pellet count), or to shoot heavier loads. Increasing pattern density can also help increase pellet distribution. It’s commonly accepted in the ballistics world that it takes 3 steel pellets on target to harvest most waterfowl cleanly. Increasing pattern density insures that enough pellets are in the pattern to achieve this. For ducks, pattern density at 20-30 yards is extremely high with a 1.5 ounce load of #6 steel pellets which has 473 pellets. Due to the poor long range ballistics of #6 steel shot, however, the pattern density falls off quickly beyond 30 yards. Pick a pellet size suitable for the range you’ll be hunting. Pattern your shotgun with multiple loads to find even pellet distribution. Shoot a heavier load to increase pattern density. Decrease pellet size to gain more pellets on target and close gaps in patterns. Use tungsten shot in order to increase pattern density even further. Shotgun patterns can be improved by switching chokes, loads, or barrels. These three components are the heart and soul of what makes a good shotgun pattern. Testing as many choke and ammo combinations as possible will help you find what works the best with your shotgun. A premium choke, like Patternmaster, may help you get the desired results quicker than your factory chokes will. If patterns are blotchy and have gaps that a duck or goose can fly through, you can always experiment with other brands of ammo that may give you better results. Pattern density can be increased by dropping down a pellet size which can help fill in the gaps in the pattern. Pattern as many gun/choke/ammo combinations as possible. Purchase a premium choke tube to help improve patterns. Increase pellet density by dropping down a pellet size. Try a heavier, slower load. Hastings barrels are designed to keep the wad from spinning as it travels down the barrel. This results in a 7-10% increase in the amount of pellets that make it to the target. Switching to a Hastings barrel may help improve your shotgun patterns. Which chokes pattern the best for waterfowl? Choosing the choke that patterns best for waterfowl is highly subjective. Not all choke tubes work well with every model of shotgun or brand of ammo. With that said, premium chokes do seem to provide a better starting point to narrow down a good patterning setup. The most popular choke tube for waterfowl is the Patternmaster choke. This wad stripping choke slows down the wad prior to exiting the barrel so that the pellets exit first. Without the wad to affect the pellets, the patterns are denser and the shot string is extended. Terror chokes are another premium choke that patterns really well for waterfowl. Terror chokes have tighter constrictions and are great long range chokes. Unlike the Patternmaster with wad stripping technology, the Terror choke is a smooth walled extended choke designed to shoot fast steel consistently dense at long ranges. Click here to see the full list of the best choke tubes for waterfowl. Every waterfowl hunter should pattern their shotgun with the ammo, choke, and shotgun they plan to use in the field. A good pattern means more birds in the bag, less frustration due to misses, and ammo cost savings down the line. The best way to pattern a shotgun for waterfowl is to test as many choke, ammo, and shotgun combinations as possible. It’s likely that a certain choke and ammo may work well out of a Benelli SBE, but pattern poorly in a Remington 870. Patterning is the only way to find out how your shot is really performing. Patterning a shotgun can be done in 7 easy steps. First, settle on the ammo, choke, and shotgun you’ll be using to hunt waterfowl. Next, find an area to pattern your shotgun that is at least the max range you intend to shoot. 30 to 40 yards is a good starting point. Step 3 is to construct a patterning board to fire at that will accommodate a 30 inch diameter circle. A patterning board of 60 inches in diameter will insure that you catch any flier pellets. Step 4 is to fire at the center of the patterning board. The next step is to document the pattern by circling each pellet hole with a sharpie marker and taking a picture for future reference and evaluation. Each load should be patterned three times to develop a 3 shot average. With the results, ammo and choke combinations can then be evaluated for effectiveness, pattern density, and pellet distribution. With these steps, patterning a shotgun for waterfowl hunting is extremely easy and efficient. Developing a good pattern will not only make you a better hunter, but it will help reduce missed shots and save you money in the long run. Having trouble seeing birds at shooting time? Check out our top picks for the best hi-viz shotgun sights!